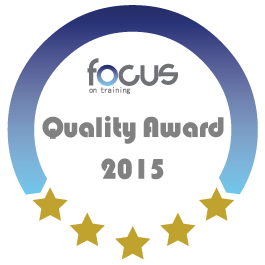 "The Focus Quality Award is made annually to a select group of Focus delivery partners who consistently achieve the highest delegate ratings. All Focus course delegates are invited to complete an online post course survey. This helps ensure that we are delivering high levels of customer satisfaction. The survey results provide a unique database which enables us to benchmark the performance of many training delivery specialists, with analysis across a range of popular course categories. Our Awards are based on performance achieved over a period of 2 years."